ATX benchtop conversion retains safety features, delivers plenty of current. [Bogin] was looking to add a benchtop power supply to his array of tools, but he didn’t really find any of the online tutorials helpful. Most of what he discovered were simple re-wiring jobs utilizing LM317 regulators and shorted PS-ON pins used to keep the PSUs happily chugging along as if nothing had been changed. No, what [Bogin] wanted was a serious power supply with short circuit protection and loads of current. 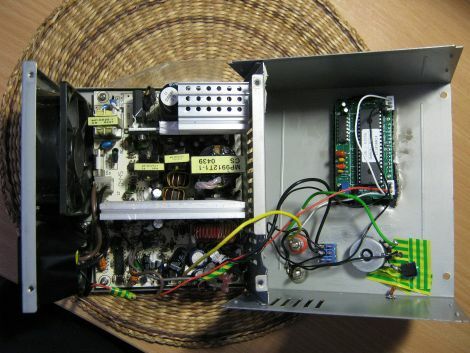 He started the conversion by disassembling a 300 watt ATX power supply that uses a halfbridge design. After identifying the controller chip, a TL494 in this case, he proceeded to tweak the PWM feedback circuit which controls the supply’s output. A few snips here, a few passes with a soldering iron there, and [Bogin] was ready to test out his creation. He says that it works very well, even under heavy load. His tutorial is specific to these sorts of PSUs, so we would be more than happy to feature similar work done with those that implement other design topologies. In the meantime, be sure to check out a video of the hacked power supply in action below. That is a different approach to re-using a pc supply, it needs output protection though. I see a lot of pc power supply used for something else and almost always they rely on the ATX supplies built in protection and that is a very bad idea. You don’t want to be hooking up a 30A supply to a device that only needs 1A or even 5A because you will destroy that device long before the ATX protection shuts the supply down. If nothing else use fuses or a resistor between the device and the supply. Not all ATX supplies even have internal protection. I’ve blown at least 2 of them by shorting them. I’ve got a few friends that do these bench supplies from PSU’s they have left over. The first test is a short circuit. If it can’t survive that… they toss it. You can use car fuses too, since they come in the 12v variety and in various amp ratings and you can get easy holders to put them in that make it easy to replace them. Seed have a new ATX power adaptor with 1.25Amp Fuses. 1.25A seems bit low though, considering that 300W power supplies can easily push ten times as much. That is a different approach to re-using a pc supply. lol ive had PC powersupplys with NO shortcircuit protection AT ALL! … and extra thin (output) wires to boot! (when shorted) … lit up like a christmas tree … the wires glowed red, then orange, then yellow, then i cut the power. PS: its manufacturers like that, that are responsible for house fires, injury, and death. PPS: CSA? UL? TUV? lolz like it makes a difference! There a ton of fake UL listed items on the market, everything from extension cords to kitchen appliances. If it doesn’t list the UL number for the item 99% of the time it is fake. Using the UL number you can look up a device on the UL site to see if it is really what it claims. Who says electronics isn’t fun and exciting? They couldn’t have looked too hard online for a high current power supply. I managed to find one, then I reposted it over at Instructables. Do a search there for 300+ watt and it should turn up (first I’m pfred2). It is a simple build I managed to cobble together out of parts I had laying around. It is adjustable voltage and adjustable output current too (which is really fancy short circuit protection). The next PSU I want to try to make is my own SMPS. I’ll use parts I scavenge out of old PSUs, but I’ll make it myself. SMPS are fascinating, modding ATX PSUs isn’t.